Situated on the foot of Trai Thuy Hill, Long Son Pagoda is the largest pagoda in Nha Trang City. Every year, the Pagoda attracts no less than ten thousands of visitors coming to see and praise the 79 feet tall white Buddha statue, Kim Than Phat To. 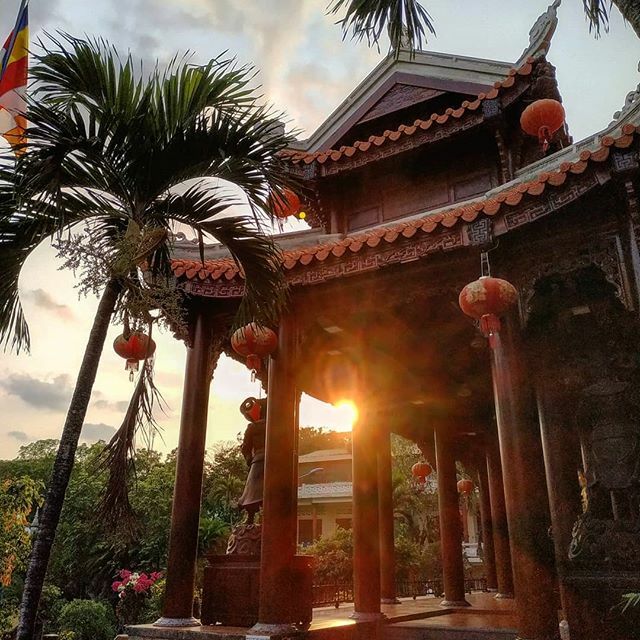 A visit to Long Son Pagoda not only gives you a chance to discover numerous architectural feathers but also historical and cultural values that the Pagoda has embodied for centuries. Read on to discover a full guide to find your peace in mind at Long Son Pagoda. One of the things I loved about Nha Trang is that among several exhilarating tourist attractions, still remain some peaceful corners to calm your minds and souls.It took me around 10 minutes by scooter to travel west of Nha Trang to Trai Thuy hill, a place of Buddhist pilgrimage. Right on the foot of Trai Thuy hill, Long Son pagoda stands on the crowded street – No.20 23/10 street – but still remains solemn. This is undoubtedly one of the top things to see in Nha Trang. What to expect at Long Son pagoda? Admire one of the oldest and biggest pagodas in Nha Trang. Explore the beautiful mosaics of dragons composed of glass and ceramic tiles. Marvel at the largest statue of Buddha in Vietnam. Immerse yourself into a refreshing atmosphere and breathtaking view of Nha Trang city. Long Son pagoda, or White Buddhist Pagoda as called by the locals, is a beautiful Buddhist temple built in the 19th century. This pagoda was first built on top of Trai Thuy hill 1886 under the abbotship of Thich Ngo Chi (1856–1935). However, for years after that, it had been heavily damaged several times in the cyclone and in the Vietnam War. So the Buddhist Association in Khanh Hoa province finally moved it down the hill. Moments after arriving, I was immediately amazed by the beauty of the pagoda’s architecture. A pair of dragon mosaics stands firmly at the entrance, while lush topiary lines the main grounds. The greenery of the lushes on the ground and the mountain at the back gave me a relaxing feeling when standing in its spacious courtyard. Not just that, traditional Vietnamese architecture, Taoist architecture or ornate sculptures of mythical animals accounts for the design of every single detail in this pagoda. The spacious main hall also functions as a monastery because it can hold up to hundreds of Buddhists and pilgrims to worship. On the 1st and 15th of the lunar month, many tourists and local people come to Long Son Pagoda to worship, watch or find peace in this pure place. The guardian lions are typically made of stone. This concept originated from Chinese Buddhism, where people believed it could protect the building from harmful spiritual influences. On the way to the top of Trai Thuy hill, at the first stop, on the 44th level, you will admire the reclining Buddha statue made of marble. People say that The Reclining Buddha represents the encouragement that all beings have the potential to awake, enlighten and release themselves from the suffering- a characterization of the cycle of rebirth. The serene and smiling expression of the Buddha in reclining Buddha statue portrays the compassion and calmness that come with the enlightenment. In the background, there is a finely carved relief which describes the scene of 49 disciples of the Buddha converged on the day Buddha passed away. Coming to the second stop is a bell tower with a 1500 kg Dai Hong Chung Bell which was donated by the Hue Buddhists in 2002. When the bell echoes in the middle of the vast forest, I could feel the calm deep in my soul and cleared my mind. After climbing 193 steps to reach the top of the hill, you will finally be able to admire the white Buddha statue. The statue sits stately in the sermon between the vast white sky, immensely free as a symbol of Nha Trang. From the ground up, the statue is 24m and from the base of the statue, it is 21m. The figure of the Buddha is 14m while the lotus blossom comprises 7m. Around the Buddha statue are statues of 7 errants. In front of the statue are a pair of dragons, which are 7.20m long. The statue is visible as far as one enters Nha Trang city, either by national highway or by train. The beautiful and solemn statue has beautified the noble and elegant beauty for the pagoda. This white statue of Buddha here is absolutely the top thing to see in Nha Trang. When I climbed to this height, I was so tired but the view soon caught my eyes. Here you will easily get bird’s eyes of beautiful Nha Trang city. From the islands to the wild landscape of immense mountains, all are narrowed down to the eye. In the midst of spirituality subdued gentle breeze spread the taste of heaven and earth. If you love the panoramic view, this is one of the top places to visit in Nha Trang. What to bring: Please don’t wear flip-flops nor scandals. Dress respectfully. A pair of sneakers will suffice. Take a bottle of water with you because climbing will make you tired. 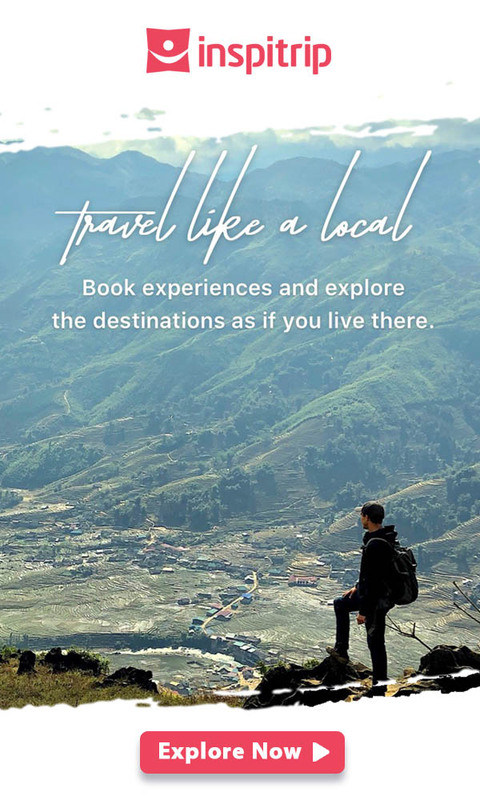 Because I traveled with my family, including children, I decided that we would go on a tour to keep us together and not to waste time on planning an itinerary. It turned out to be an amazing trip because the tour took us to not only Long Son pagoda but also many other fascinating places like Oceanographic Institute, Marine Creature Museum, Ponagar Cham Tower, Chong Rocks. Here you can find the tour “Explore Nha Trang in one day” that I booked. Call a traditional taxi, Grab-taxi or Grab-bike, it only cost you around $1 from Nha Trang city center. However, I recommend you to ask your hotel receptionist for advice on which taxi company you can choose. There are some unreliable drivers on the street who may overcharge tourists. If you are a solo traveler and want to feel the ocean breeze on the way, you can rent a motorbike. Remember to check your motorbike to see if it is well-functioning before you go. Get a SIM card or portable WIFI device and you will never get lost. If you depart from the city center, go to Tran Phu street and turn at Le Thanh Ton street. Go straight and turn left to Thai Nguyen street when you see the famous Kito church. I think that’s all about the essential tips when visiting Long Son pagoda Nha Trang. You’ll find more interesting destinations in Nha Trang in our blog. Check this out! And don’t forget to share with me your unforgettable memories here in the comment below.